John Patteson, Surrey St., Norwich; Christie's, on the premises, 28 May 1819, lot 32 (2 gns to the Willins). Colonel Clement Unthank, Intwood Hall, Norfolk; sale, Robinson and Fisher, London, 27 May 1897, lot 168 (120 gns to Salting). William Asch, his sale, Christie's, London, 15 December 1922, lot 127 (241 gns to F.T. Sabin). with F.T. Sabin, London, 1922-4. Dr C. Benedict & Co., Berlin, 1927. C. Hofstede de Groot, A Catalogue Raisonné, VIII, 1927, nos. 691 and 1044. H.-U. 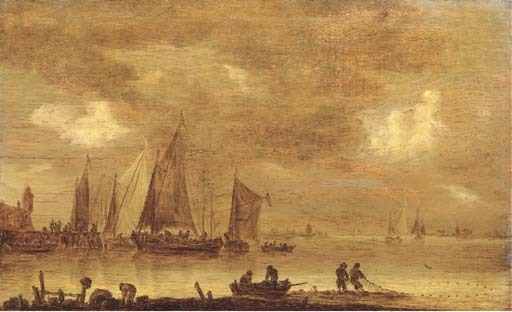 Beck, Jan van Goyen, II, 1973, p. 391, no. 873, illustrated. John Patteson (1755-1833), a wealthy brewer and merchant from Norwich, was one of the most important collectors from Norfolk during the early nineteenth century (for an extensive discussion of Patteson and the 1819 sale, see A.W. Moore, Dutch and Flemish Painting in Norfolk, 1988, pp. 40-7.). He had travelled extensively in Italy and on the continent, but these trips do not seem to have been occasions to make purchases. The major impetus to his career as collector came in 1781, when he acquired through marriage the pictures formerly belonging to the Rev. Cox Macro (1683-1767) of Little Haugh Hall, Norton, near Bury St. Edmunds, Suffolk. This collection consisted of approximately 42 works, mostly by Dutch artists and many of good quality. Subsequently, he purchased a significant number himself, although with the exception of works acquired from Norfolk artists, his acquisitions were apparently made primarily on the continent and from unknown sources. By 1819, however, Patteson's businesses were in serious financial difficulty. He had been both mayor and sheriff of Norwich as well as M.P., but the collapse of a bank in which he had an interest finally forced him into a state of near bankruptcy. His pictures were among the first things to be put up for sale, resulting in an auction that was probably the most important ever to be held in Norwich. That James Christie was enlisted to organize the sale instead of a local auctioneer is a testimony to the value of the collection, but it is not clear why the sale was not held in London (Getty Provenance Index).